Smart, high quality zipped underbed storage chest. Made from strong and durable polyurethane backed 100% polyester - cream with black trim. Space saving storage with useful internal mesh pocket ideal for putting moth repellent blocks/sachets into. Top opening lid with strong zip fastening. Holds 1 double duvet or 4 pillows. 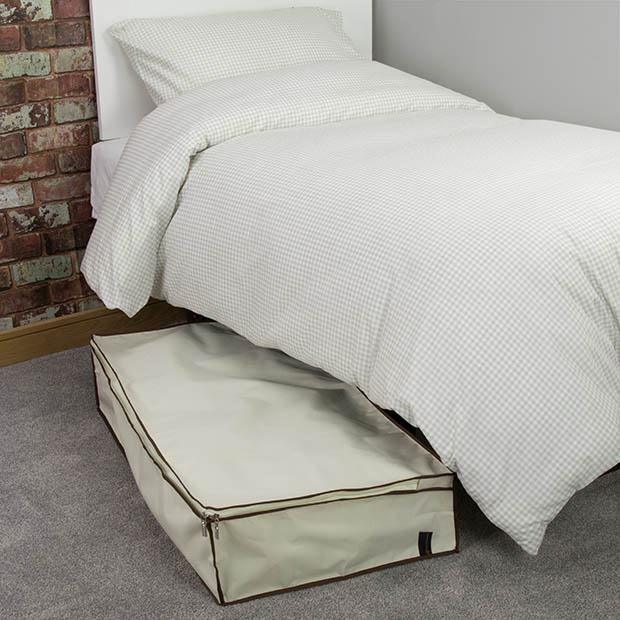 Ideal for storing bedding, curtains and out of season clothing - fits neatly under your bed. Size: Width x Depth x Height 96cm x 48cm x 18cm approx. I ordered 2 of these bags to store spare bedding. They are very spacious and I have since ordered 2 more. Good product at a very reasonable price and free delivery.